that stays with me night and day. and even shortens lives (Sir 30:24). damaged relations, persecutions, and worse things. rather than being jealous of them. and with all others in you. Those of you who are interested in the Fanzaga book Wrath of God, will be interested in Fr. 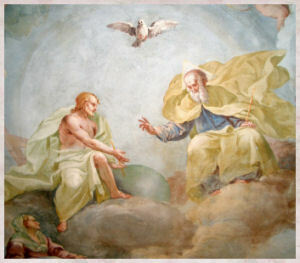 Schall's recent article which can be found at Inside Catholic: The Lord of the World. Father Fanzaga posed the question "How can it come about that Christianity, which once formed entire civilizations, will be reduced to a 'little flock'? "Was the fall of the Church a consequence of having lost faith or was it its cause? the fall of the Church was brought about by loss of faith. The faithful rejected the faith. They fell because of internal collapse. The religious deception is well advanced. When I read this part again, it was obvious that is what Fr. 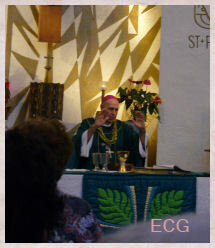 John Corapi was trying to emphasize on his recent appearances on EWTN. 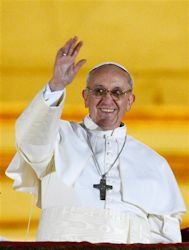 He was addressing the wake-up call Catholics recently had in Connecticut as well as the other evils that we are faced with now on an almost daily basis. He pointed out that only 20% of "Catholics" go to Church regularly. He was sure that if all those Catholics were firm Catholics (I'm paraphrasing) we could stand up to these evils. Father also firmly stated that we need to wake up and not be complacent. Father said the days of it being enough to go to Sunday Mass are not enough. We need to be watchful and be ready and also as importantly, not to be fearful. 1. The Church cannot be broken by external persecution. Father Fanzaga quotes Tertullian's believe that external persecution strengthens the Church. The blood of martyrs is the seed of Christians. 2. The Church falls because of internal betrayal and infidelity. The infidelity referred to due is "our desire to diminish God and replace Him with ourselves and our desire for this world". Fr. Fanzaga praises the foresight that Benson had in 1907 when he wrote the novel. It was then that he envisioned the erosion of the Holy Bible's authority as a Sacred Book. This would in turn change Christianity to a religion that denied the divinity of Christ. There would be "a desire for emancipation on the part of a clergy which no longer perceives its supernatural state, loses its identity, abandons celibacy and which becomes absorbed by the world." Father Fanzaga here reminds us that in the 1970's the Church who had 400,000 priests, lost 80,000 of them. Benson did not perceive that atheism would cause the crisis of faith but instead the rise of a new religion which deifies man. This new religion would have its ministers, own rites, own ceremonies, etc. The person of the Antichrist is manifest at the center of the great schism of man from God. He is at the heart of man's self-deification. He is the one whome Paul calls 'the man of iniquity.' He is the supreme manifestation of humanitarian religion. It is impossible to separate the Antichrist from the specific context of apostasty, loss of faith and rebellion against God. and I do not know how to react to it. and to carry it out without fear or hesitation. Let me fear nothing except to be faithless to you while avoiding bitterness, defensiveness, or retaliation. because they are founded on you. so that I may change my ways. 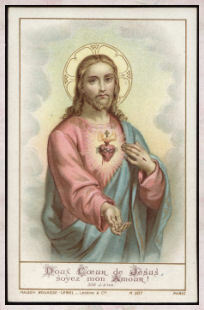 in imitation of your Son, our Lord Jesus Christ. 661 Long face, rough manner, ridiculous appearance, unfriendly attitude. Is that how you hope to inspire others to follow Christ? and I have been unable to shake it so far. and everyone rubs me the wrong way. I just cannot seem to get my true bearings. your countless gifts and overwhelming love for me. by placing myself wholly in your hands. and communicate it to others. 658 If things go well, let us rejoice, blessing God who makes them prosper. And if they go badly? Let us rejoice, blessing God who allows us to share in the sweetness of his Cross. ..."I am convinced that Christians should free themselves from the idea that the Antichrist can come from anywhere, Heaven or Hell, and that he will manifest himself s an evil person who will impose his dominion by force. Dear friends, the contrary is the case. The Antichrist will appear in a very specific context--that of the triumph of the spirit of the world in the form of the religion of man. From a human point of view he will be a fascinating person. From a natural perspective he will be the best human being produced by nature. He will be proclaimed as Lord and God by all the churches of the world which he will have reordered for the adoration of man. Everything will be done through conviction and not through force. With the eyes of faith we can see him as the incarnation of the Devil and the supreme manifestation of evil. From a worldly perspective, however, he will regarded as one of the greatest men ever to have been born. He will possess an incredible power to seduce man. He will possess in himself a fascination for everything beautiful that nature has ever produced. For this reason, perhaps, Christians will find it difficult to see him for what he is...Fr. Livio Fanzaga. A few years ago, one of my good friends not only highly recommended Fr. Fanzaga's book Wrath of God: The Days of the Antichrist, she loaned it to me. I picked it up, tried reading it but I could not get interested in it. That was the end of that and I put the book out of my mind. Since it was Lent, I decided to finally read this book and I haven't been able to put it down. Fr. Livio Fanzaga is a well known Catholic writer in Italy. 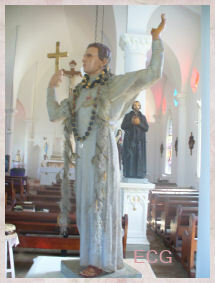 He is known as the "radio priest". This book consists of the transcripts of two of Father's radio broadcasts in 1993-1994 on Radio Maria. In those broadcasts, Fr. Lanzaga tackled the topic of the Antichrist, based mainly on two works of literature: A Short Tale of the Antichrist by Vladimir Soloviev and Lord of the World by Robert Hugh Benson. ...At the beginning he has no hostility against Jesus. He recognized his good intention and his lofty teaching. Three things about Jesus were unacceptable to him: firstly, his moral preoccupations; then his claim to uniqueness; and the third thing the Antichrist could not accept about Christ was that He lives, so much so that he screams to himself repeatedly: "He is not living, He is not and shall not be! He rotted in the tomb, rotted like the lowest...!" There is so much that I could go into greater detail of Father's analysis of the Antichrist such as his political and social agendas. Since space does not permit, I will focus on the Antichrist's religious agenda. Of course, the Antichrist doesn't introduce himself to the world as such. He instead declares himself to be emperor of the world. Why his interest in religion? It is because it is his objective to eradicate Christianity, ..."after which he knows that he will have no difficulty in brushing away all other religions." "At the time of the Antichrist the number of believers will be greatly reduced. In the whole world Christians will number no more than forty-five million. A great apostasy is taking place. The program of political and social reform, so successfully carried through, seems to satisfy man's every desire and need. Many are enchanted by the new religion of humanitarianism and have turned their backs on the faith. What the Gospel says of false prophets has come to pass (cf. Mt. 23:11 ff; Mc 12:22). The greatest of these is the Antichrist." In one powerful section of the book, the Antichrist decides to call the religions together to a council which he will lead. It is to be held in Jerusalem. Soloviev's tale on how only a "tiny flock" will remain is very intriguing. Those who stand firm and who will expose the Antichrist will be Pope Peter II of the Catholic Church, the unofficial leader of the Russian Orthodox Church, the Starets John and a a religious Protestant professor named Ernst Pauli. The emperor transfers his residence to Jerusalem...Only one temple will be erected. It will be an imperial temple in which all religions will be united. But who will be adored in this temple? The man made god, the Antichrist, will be worshiped in this temple. " This emperor soon to be exposed as the Antichrist as aforesaid, speaks to all present in a soothing, seemingly concerned tone and manner. "Dear brother Catholics! oh, how well I understand your view and how I should like to find support for my power in the authority of your spiritual head! ....I solemnly declare: in accordance with my autocratic will the chief bishop of all Catholics, the Pope of Rome is henceforth restored to his Roman See with all the rights and privileges that had ever been given it by my predecessors beginning with Emperor Constantine the Great. 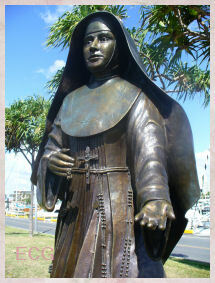 "And all I want of you, brother-Catholics, is an inner heart-felt recognition of me as your only defender and patron. 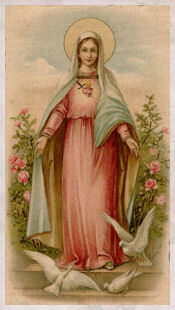 Let those who regard me as such in their heart and conscience come to me here.' And he pointed to the empty seats on the platform." How do the Catholics respond to this request? How would each and everyone of us react if we were given the choice? I have been thinking and praying about this a lot lately. "With joyful cries 'Gratias agimus! Domine, salvum fac magnum imperatorem' almost all the princes of the Catholic Church, cardinals and bishops, the majority of believing laymen and more than half the monks went up on the platform and after low bows to the emperor, took their seats there." It appears that the Catholics have abandoned the Catholic Church for the promises of the Antichrist. So, what happened to the Church? "But down below in the middle of the hall, straight and immovable as a marble statue, the Pope, Peter II sat in his place." Where the pope is, there too is the Church. "All who had surrounded him were on the platform. But the thinned ranks of monks and laymen closed around him, forming a narrow ring, and a restrained whisper came from there. "Non praevalebunt, non praevalebunt porte inferni.'" And so, after the Emperor finishes with the Catholics, he addresses the Russian Orthodox in a similar manner and then the Protestants. It is quite moving reading about how the leaders of the other two Christian religions unite with the Catholic Pope and his tiny flock. In the second part of his book, Father Fanzaga analyzes the Antichrist in Father Robert Hugh Benson's Lord of the World. Julian Felsenburgh is the name of Benson's Antichrist. Unlike Soloviev's European born Antichrist, Felsenburgh is an American. "Benson presents a positive image of the Antichrist. It is a portrait of a politician of high human qualities. He is calm, serene, educated, a pacifist and a universalist. He can bring people into the way of justice, prosperity and peace. There will be no more misery or violence at the time of his appearance. Instead there will be perfect concord and fulfillment of the materialist ideal as well as that of Masonry and communism. 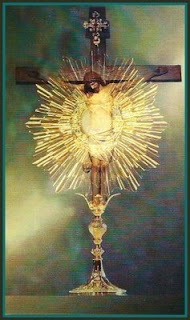 Catholicism alone will resist him. At the end of the Benson novel, there is a "settling of accounts" by two armies. The Humanitarians who followed the religious deception of the Antichrist and the tiny flock of the Catholic Church, led by the Vicar of Christ. The book is very interesting reading. It was hard to put down. I suggest that if you do read it to do so with the Catechism of the Catholic Church and Holy Bible at your side for references to many of Father Fanzaga's citations. Father does delve into several possibilities regarding the coming of the Antichrist and the end of the world according to two main writers as well as his own interpretation. A red flag did go up when I saw Father Fanzaga referring to works of controversial Maria Valtorta, until I realized he was not focusing on her spiritual writings such as the Poem of the Man-God, but instead of the context of her description of the Antichrist. He even offers a disclaimer about her works as the Vatican has cautioned. I highly recommend this book. In searching for another copy for my family, I noticed that it is very expensive to obtain. 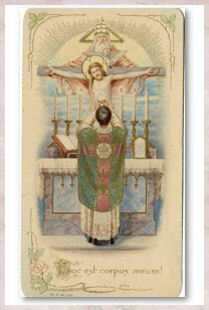 It is more affordable when buying from an online Catholic book supplier. Note: I found a blog writer who has attempted to translate Soloviev's book from the original Russian. Source: here If you read Russian, then you can read the book in the original Russian by clicking a link on that blog. BTW, the complete title is The Three Dialogues and the Story of the Antichrist by Vladimir Sergeyevich Soloviev. 675 It's true that he was a sinner. But don't pass so final a judgment on him. 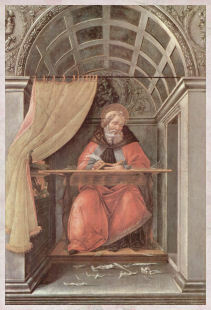 Have pity in your heart, and don't forget that he may yet be an Augustine, while you remain just another mediocrity. The following was shared by Madalena via email. 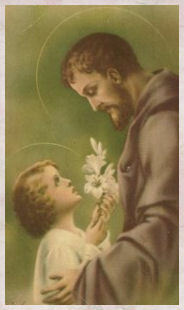 St Joseph is the patron of a Happy Death. 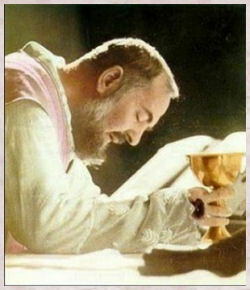 One day a woman emerged from confession to ST PIO OF PETRELCINA weeping profusely because he had told her that her three sons had already been lost forever, and they could have been saved if she had prayed for them. This is confirmed by Our Blessed Mother at FATIMA: “So many souls are lost because they have no one to pray and make sacrifices for them”. Let this not happen to any of our children. In preparation for the Feast of St Joseph let us pray each day of the novena to take care of our children and obtain for them a happy death. Set out below is a prayer we can say for this intention, for each day of the novena and perhaps every day. Remember too that if you enroll any nearest and dearest as a third party living member you will have the holy souls praying for their salvation as well as yourself. For I am their Mother/Father. AMEN. St Joseph, Foster Father of Our Lord Jesus Christ and True Spouse of the Blessed Virgin Mary, pray for the dying of this day and this night." God our Father and Creator, You bestow on us gifts and talents to develop and use in accord with Your will. Grant to me, thru the intercession of St. Joseph the Worker as model and guide, employment and work that I may with dignity provide for those who depend on me for care and support. Grant me the opportunities to use my energy and my talents and abilities for the good of all, and the glory of Your name. to dispense everywhere His graces and blessings. but above all, keep far from them all the evils of sin. they may in Heaven receive the recompense promised to pastors according to the Heart of God, Amen. I am enmeshed in a time of spiritual aridity. and I cannot even pray. which facilitate prayer and the practice of the virtues. and I want to remain close to you. that is when he is closest to us. even if I feel they are useless. and help me remain united with you. 674 Never give your opinion if you are not asked for it, even if you think that your view is the best. and I cannot root it out. and give me peace of heart as well as mind. and grow into a better human being. 671 Jesus remains silent. Jesus autem tacebat. Why do you speak, to console yourself, or to excuse yourself? 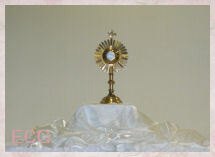 What Book Did My Husband Read During Adoration? 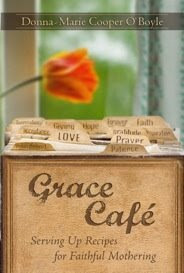 Yes, DH began reading Donna-Marie Cooper O'Boyle's book Grace Cafe. When my family and I go for our Hour of Adoration, we bring a tote bag full of books to read should we care to do so, during our visit with Jesus. 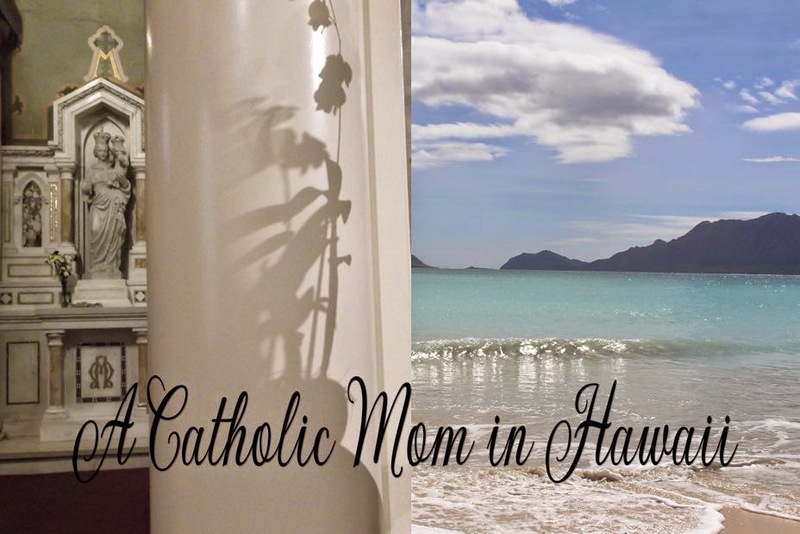 This week, a few of the choices included St. Josemaría Escrivá's The Way and Grace Cafe. Before I knew it, my husband was engrossed in reading Donna's book. He told me afterward, he thought it was beautifully written. He loved the clever way it was laid out with old-fashioned recipe cards. He said he could see it helping women to re-identify with the traditional values and the importance of being a wife and mother. Dan: "Since I plan to continue reading this book, my initial impression is to recommend it anyone who needs a book that is thought-provoking and introspective in its Catholic spirituality." So thank you Donna for writing a book that both my husband and I enjoy reading and one that makes us grow closer as a Catholic family. America Needs Fatima's "It Began When My Father Left"